Bhí ‘Seachtain na Gaeilge’ againn an tseachtain seo caite. Rinneamar iarracht a chinntiú go mbeadh gach dalta páirteach. Bhí deis ag cách an cúpla focal a úsáid. Is rud tábhachtach í an Ghaeilge dúinne sa scoil seo. Ba chóir go mbeimís bródúil aisti agus go mbeimís sásta í a labhairt. Bhí go leor deiseanna againn é sin a dhéanamh i mbliana. Chuir daltaí ribíní ar gheata na scoile le seanfhocail orthu. Bhí muintir na háite an-tugtha don bhfeachtas seo agus fuaireamar tuairimí dearfacha dá bharr. Tá sé mar aidhm againn an Ghaeilge a spreagadh i measc na scoláirí agus na múinteoirí araon. D’eagraigh muintir na cúigiú bliana maidin chaifé sa leabharlann. D’oibríomar go dian dícheallach le hIníon de Barra agus rinneamar gaisce. Bhain cách sár-thaitneamh as an maidin. Bhí atmaisféar iontach le sonrú le linn an phoc fada. Bhailigh slua mór timpeall chun tacaíocht a thabhairt do na daoine a ghlac páirt ann. Rinne gach ball den scoil iarracht cuplá focal a úsáid le linn na seachtaine. I gColáiste an Spioraid Naoimh, táimid bródúil as an nGaeilge, agus bródúil freisin as ár n-iarrachtaí í a labhairt. Bhí Tráth na gCeist, comórtas ealaíne, díospóireacht dhá-theangach agus go leor imeachtaí eile ar siúl. Níl aon dabht ná go raibh seachtain iontach thairbheach againn i mbliana. Bhí deis ag gach dalta a bheith páirteach i slí amháin nó eile. Every year the staff in C.S.N. hold a staff coffee morning to support Daffodil Day. This year it was decided to support Daffodil Day in a slightly different way. Some of our staff members prepared a buffet of healthy snacks for break-time and they went down a treat. Many thanks to all involved in organising the Daffodil Day fundraiser and thank you to all of those who contributed to generously. Hard luck to our U17 Soccer team in today’s All Ireland semi final. They played really well against Lucan C.B.S. but it wasn’t to be. The score at half time was 0-0 but Lucan scored early in the second half and they scored again just before the final whistle. The final score was 2-0. Well done to our U17 team and their coaches Mr O’Mahony, Mr Burke & Mr. Davis. They have had a brilliant season and have done C.S.N. proud. Best of luck to Lucan C.B.S. in the final. This annual enterprise competition is run by the Cork City Enterprise Board for junior students from First Year and Second Year. Our First Year Business students took part in the competition this year. They were challenged to come up with a Business idea and to explain its strengths and weaknesses. They also had to describe their target market. And our students did extremely well, winning three awards. Best Business Stand: Diarmuid O’Halloran. Each of these Business proposals were highly praised for their creativity, for their research and for the enthusiasm of the students involved. Well done to all of our students for taking part. Thank you to the competition organisers, the boys had a fantastic day and are already looking forward to next years competition. Our Mini Company students were in U.C.C. on Tuesday 12th March to take part in the Local Enterprise Schools Competition. Congratulations to our Mini Company, Rook Ltd.
Bryan McGovern and his team won the overall First Prize and have qualified for the National Finals which will be held in Croke Park. Congratulations also to Eventi! The team lead by Gavin Malone won Third Prize overall. Fantastic achievements. Well done to them all and best of luck to Rook Ltd. in the National Finals!! 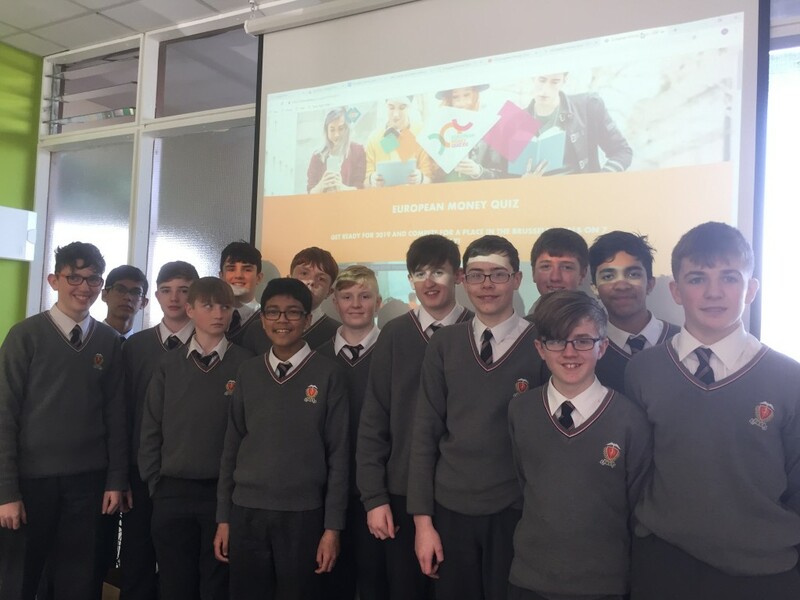 15 students from 2nd year Business Studies took part in the European Money quiz held on 12th March. The European Money Quiz is a European-wide competition to improve the financial literacy of 13-15 year-olds. The quiz is part of European Money Week, an annual initiative organised by the European Banking Federation, to promote financial education across Europe. 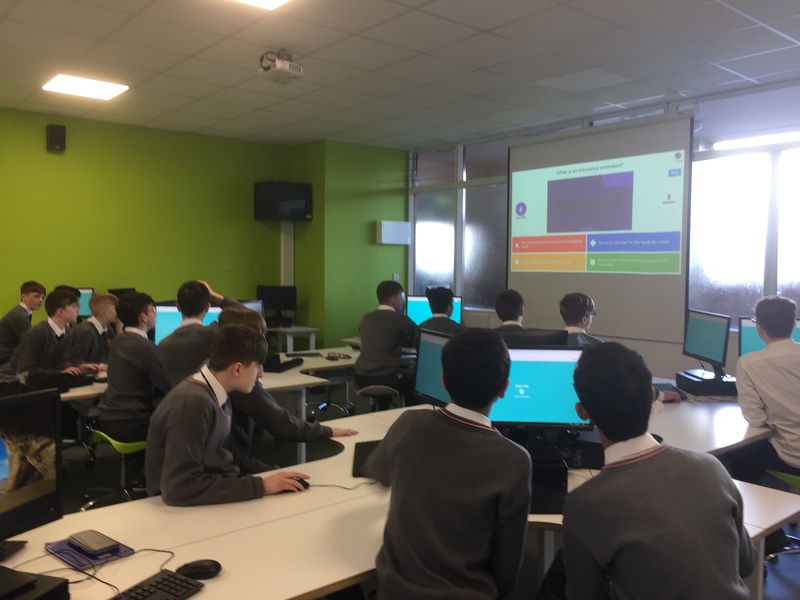 The students competed against 423 other teams from across the country in the Irish National Final using Kahoot. Those who took part were Fionn Long, Tim Callanan, Romith Mahmood Romith, Ciaran Kerrigan, Alex Brosnan, Adam Phelan, Fuad Haque, Kyle Daly, Brian Donnelly, Jack Twomey, Kevin Delage, Ben Maher, Cian Donovan, Joen Anil and Eoin Scully. Wishing our U17 Soccer Team and their coaches the very best of luck on Thursday 14th March!!! The team will play in the F.A.I. Schools – U17 ”A” Junior National Cup Semi-Final against Lucan C.B.S. The match will take place in the Waterford Regional Sports Centre. Cian Connolly (Capt. ), Michael Quirke, Ivan Quirke, Colin O’Flynn, Andrew McElligott, Cian Barry-Murphy, Kevin Delaney, David Yoannou, Wymin Sivakumar, Jason Riordan, Kyle Donovan, Aaron Buckley, Ethan Bailey, Eoin Ahern, Chris Connolly, Liam Hogan, Conor Quirke, Prince Zeph, Joshua Keohane, Kevin Barry-Dorney, Sean Crowe, Kian O’Sullivan, Finn Stevens, Mark Donovan, Daniel O’Regan, Kevin Kelleher, Aidan Sheehan, Adam Higgins, Nathan Gough, Ross Dineen. Recently, five of the school’s junior debaters took part in a round of the Cork Schools Junior Mace, which hosted by Presentation Brothers College Cork. Those who participated were Third Year Michael Keohane, and First Years John O’Leary, Jack Garvey, Michael O’Neill, and Patrick Hayes. They debated motions relating to social media and the judicial system, the ethics of free speech, as well as others. John O’Leary won the prize of “Best First Year”, for which he received a trophy. Fifth Year Ciarán Meers adjudicated the three rounds on the day, as well as the grand final. Well done to all for representing the school. Congratulations to our First Year Soccer Team! They played Glanmire C.S. in Carraigtwohill this morning. Not a great start to the match. They were 2 goals down after the first five minutes but they came back strongly and the match went to extra time.The final score was C.S.N. – 4, Glanmire C.S. – 3Well done to the team and their coaches Mr Brett & Mr Mc Elligott.